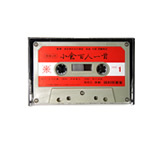 A Hyakunin Isshu is a collection of one hundred poems, one each by one hundred poets. There are numerous such collections, including the "Warrior Family Hyakunin Isshu," the "Gosen Hyakunin Isshu," the "Genji Hyakunin Isshu" and the "Women's Hyakunin Isshu." Among these the most famous is the "Ogura Hyakunin Isshu," and under its influence the others were made. In the Kamakura era, a poet named Fujiwara Sadaie selected one great poem each from the works of one hundred poets, and arranged these works--representing some six hundred years of history--in order of creation. The works he chose were all themselves taken from ten poetry anthologies, such as the Kokin and the New Kokin, which had been prepared for various emperors. Fujiwara's anthology was called the Ogura Hyakunin Isshu, after the area of Japan in which he lived. In the one hundred Ogura poems, the most prevalent theme is that of love with 43 poems devoted to it. The season of fall is the second most common theme, with 16 of the poems. Within the one hundred poets there are 21 females represented, 79 males and 15 monks. Today, the Hyakunin Isshu is particularly well known in Japan for its adoption for use in the card game "karuta." Karuta is said to have its roots in the shell-matching games played in the Heian era (794 to 1185). In these, the separate sides of a number of shells were separated, with the players then having to find pairs. It then became practice to write poems or paint pictures on these shells. Hyakunin Isshu first appeared on playing cards in the Sengoku Warring States period (from the 15th to the 17th centuries). 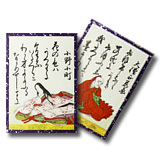 These cards were at first used in the imperial court and by the wives and harem girls of the daimyos. In time these card games came to be a regular seasonal event. Karuta was not originally the province of the common people, but the spread of wood block printing in the Edo era (1603 to 1868) led to the popularization of playing cards as a tool for teaching counting. This in turn led to the game's popularization among ordinary people during the Genroku era (1688 to 1704). It is believed that it finally became a fixture of Japanese New Year family celebrations during the Ansei era (1854 to 1860). 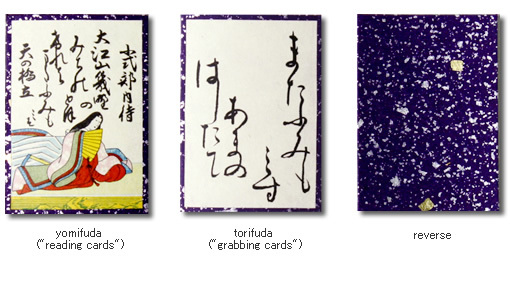 A full set of cards consists of two hundred: one hundred yomifuda ("reading cards") and their corresponding hundred torifuda ("grabbing cards"). 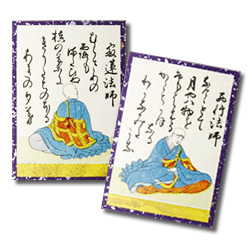 Both faces are made of layered paper, and it is not possible to distinguish the yomifuda and torifuda by their construction, materials or reverse sides. Each yomifuda features the name of one of the one hundred poets, their portrait and their famous poem. 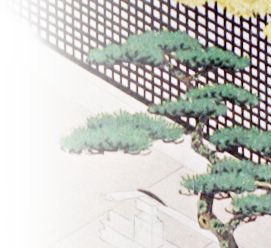 The torifuda features just the last part of the poem, written in simple hiragana script. The yomifuda are brightly and individually decorated, but with only script on the torifuda they are more difficult to tell them apart. From an era in which background was not so important, so poets appear from all walks of life--including emperors, the aristocracy, samurai, and farmers. The poems in this series are distinguished by their honesty. Famous poets include Ootomo no Yakamochi, Yamabe no Akahito, and Kakinomoto no Hidemaro. 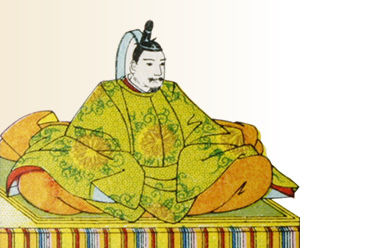 In the middle of the Heian era, the aristocratic culture flourished with the court as its centre. In the world of literature, women started to play a role with Seishounagon writing The Pillow Book and Murasaki Shikibu writing The Tale of Genji. Other female authors represented in the Ogura Hyakunin Isshu include Izumi Shikibu, Taini no Sanmi and Akazome Emon--all talented women of the court. In contrast to the Manyou era, in the Six Immortal Poets era a great many poems of delicacy and beauty were produced using techniques such as metaphor, word association and wordplay. Famous poets of this period include Ariwara no Narihira, Ono no Komachi and Soujou Henjou, all of them among the Six Immortal Poets as designated by Ki no Tsurayuki. As Japan moved from the aristocracy-centered Heian era to the less-stable warrior-dominated Kamakura era, many people turned to Buddhism for solace. These changes are reflected in the section of the Hyakunin Isshu for this period, with poems by monks such as Saigyou and Jakuren, and a poem by the warrior Minamoto no Sanetomo. Many of the poems are taken from the New Kokin compiled by Fujiwara Sadaie. Colorful, illustrative poems are widely featured, along with abstract pieces that express subtle states of emotion. 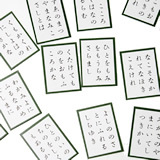 Green karuta cards. In order to get them the same size, the cards are cut flat without stacking them first. 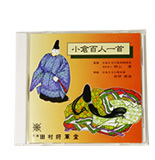 Put the included CD of readings on shuffle, and you can enjoy karuta even by yourself. 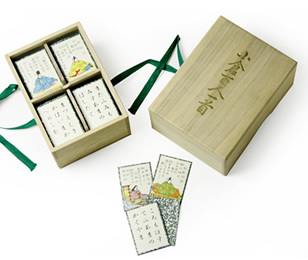 The backs of the cards are made of green Echizen paper, and the surface is processed so they can endure competition use. 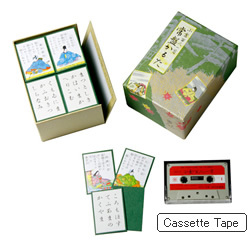 The included tape features readings of the poems, allowing you to memorize them and learn the correct way to read them. This is the most well-known game played using these cards. 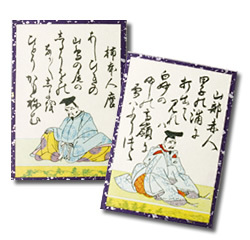 The torifuda ("grabbing cards") are spread out face up, and the players sit around them. One player is selected as the reader; this player does not grab for cards. 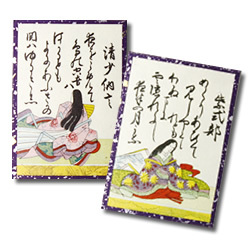 Instead, they draw the top yomifuda ("reading card") and begin to read the poem on it. 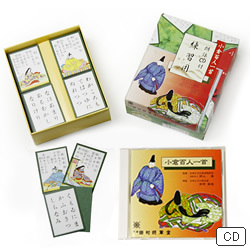 The other players must then find and take the torifuda on which is written the end of the poem being read. At the end of the game the person with the most cards is the winner. Played in two teams of 2-3 people each. Teams sit facing each other, and each team takes fifty of the torifuda and arranges them into three rows. The game is then played much like Chirashitori, with a reader and players grabbing for cards. The team whose cards are cleared first wins. 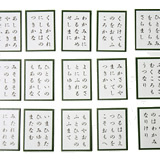 Today, the finest Hyakunin Isshu cards available are these Kahou cards, produced using a combination of expert techniques. A unique process of layering paper creates cards which are pleasant to touch and are not too thick, yet are surprisingly and impressively sturdy. The yomifuda reading cards are printed 13 times and the torifuda grabbing cards 4 times with special colors, producing beautiful designs that have the splendor of a picture scroll. 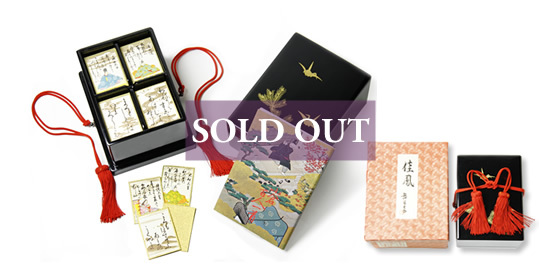 The box too is of the highest quality, made of ginko wood, lacquered and decorated with pure gold maki-e. With attention lavished on all aspects of its production, from the materials to the hand-made construction and finished appearance, this is a Hyakunin Isshu set to surpass all others. 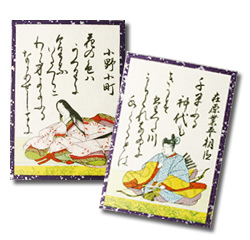 The fronts of the cards feature Echizen Torinoko paper, and the printing is checked after each color is laid down. The core of each card is a layered assembly of paper. The backs of the cards are not printed but rather sprinkled with gold and silver foil, giving them a beautiful appearance and making them a pleasure to touch. 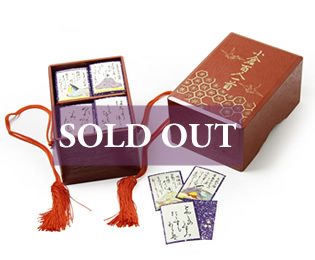 Presented in a wooden box covered in Echizen lacquer and finished with a tasseled scarlet cord, you are struck by the air of quality before you even see the cards. 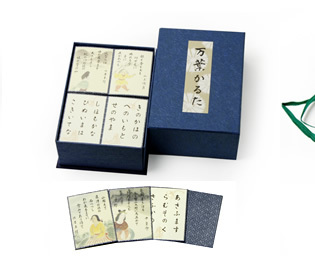 Created by hand with absolutely no compromises made, it is safe to say that this set is in the top rank of Hyakunin Isshu karuta cards.